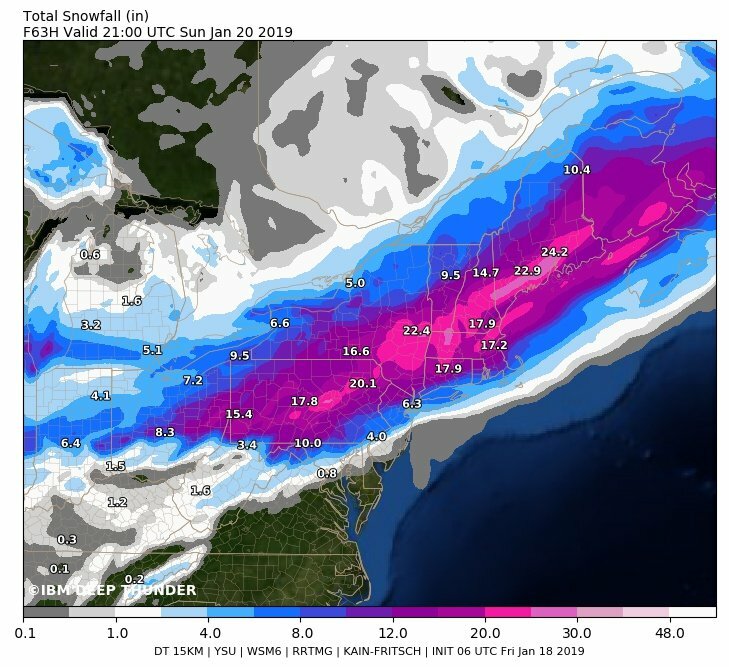 If you like to ski, next week should be fantastic in a swath from the Pocono's & Catskills thru the Greens and Whites into Maine. High Point and the Gorge should be in good shape here in NJ. That is, if it all pans out as they are predicting. I'm happy to be in the gray zone. Me to The ice is really getting talked up. I remember that bad one sometime in the late '90s. Montreal was closed down for a month or more. On a trip there in June of that year all, and I do mean all, the tree tops were snapped along the interstate north of the border, it was like a war zone. Our cabin and surrounding area had no power for weeks. That's when I decided to buy a generator. Lots of firewood that spring though. National weather service now invests in hedge funds. Sussex County may get nothing, they may get 15". It's all too complicated now. It's like they want to say, "well, we did tell you there is a likely range". Todays 4:30 briefing. The ice is getting closer. Yeah - things are looking better for us. Yep, except for the colder temps, it's looking like a non-event. And we already had those low temps this past December. Strange stuff here; we have not had any birds, not a one, come to the feeders over the past couple days. Even the squirrels are in hiding. Maybe they know something the forecasters don't? Mostly gone by around lunch time. My thermometer says 54 right now at noon. The hourly temps and feels-like for my town today and tonight. It was 56 here at 10:30 AM and the sun actually peeked through the clouds briefly. Now, at around 12:30 it's cloudy, windy, 46 degrees and dropping fast. The wind should dry the roads and trees before they freeze. We have gotten off easy so far with this storm. Now 45 just 38 minutes later. A drop of 9 degrees. My weather station is reporting 41 out there right now. All the states east of the Mississippi are getting a cooling polar breeze. 30 and a hot fire. There are campers at Batona.